As a pick-me-up, as time to relax, as an opportunity to socialize—all are good reasons to enjoy coffee. But we think we have the best reason of all. 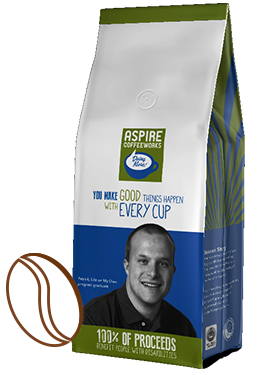 Aspire CoffeeWorks is a dynamic social enterprise between Aspire and Metropolis Coffee Company. 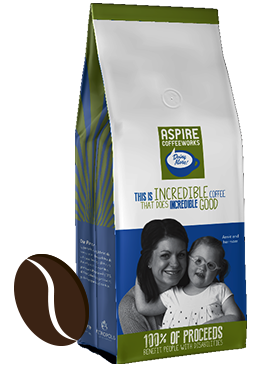 Founded in 2009 the partnership combines the work of Aspire, a leader in providing bold and pioneering services to kids and adults with disabilities, with the craftsmanship of Metropolis Coffee Company, one of the nation’s top artisan, award-winning coffee roasters. 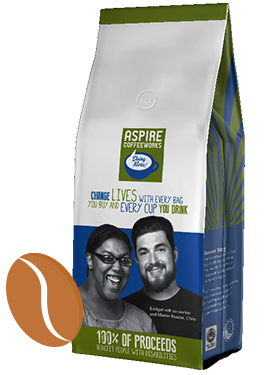 This creative and mutually beneficial partnership is one in which adults with disabilities on the Aspire CoffeeWorks team, work side by side with employees on the Metropolis Coffee Company team. That’s right, at Aspire CoffeeWorks, even the staff is perfectly blended! It’s a groundbreaking, one-of-a-kind partnership and perfect example of how adults with disabilities can be productive and successful members of the work force. And just as exciting is the fact that 100% of Aspire CoffeeWorks’ proceeds go back to Aspire’s services and programs. 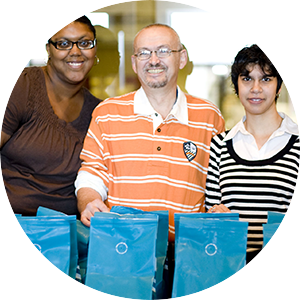 Buy our fabulously crafted coffees and you’ll join our effort to demonstrate how a diversified work force is both mutually and culturally beneficial, while also supporting life-changing services and programs for kids and adults with disabilities. When people promote and demonstrate a way of living that embraces and celebrates the inclusion of those with disabilities, everyone is better and stronger for it. At Aspire, and at its social enterprise Aspire CoffeeWorks, this is not a goal or a dream but a belief lived out every day. Aspire is one of the most innovative human service non-profits in the Midwest with an incredibly talented and dedicated team of more than 250. Plus, Aspire is backed by 200 community partners, thousands of donors, volunteers and family and friends who work together to redefine what’s possible for people with disabilities. Annually, Aspire serves over 900 participants, who have autism, cerebral palsy, Down syndrome and other disabilities. Several enterprise areas make up Aspire. They include Aspire Kids, Aspire Living, Aspire Careers and of course, Aspire CoffeeWorks. All have a focus on helping, encouraging and challenging kids, teens and adults to live to their fullest ability, in addition to creating communities in which everyone is accepted and welcomed. 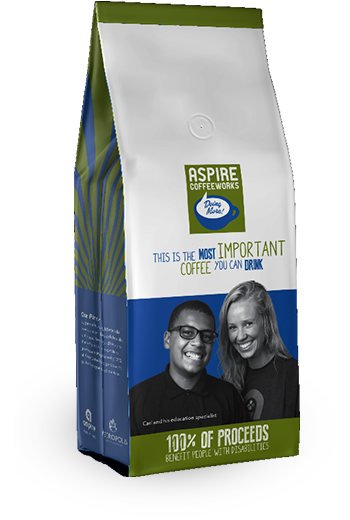 100% of Aspire CoffeeWorks’ proceeds go back to Aspire to support vital and meaningful programs and services. Every bag of coffee does things like support the physical therapy that teaches a child to walk, cover the cost for a high-tech devise that helps a teenager speak and provide classes in which an adult learns how to live independently. Every bag of coffee matters. Buy it, enjoy it, share it and spread the word. Aspire CoffeeWorks is thrilled to bring you nationally recognized, hand-roasted, fair trade and organic certified coffees, thanks to the help of our partner Metropolis Coffee Company. Metropolis has received many accolades including being named micro-roaster of the year by Roast Magazine and one of America’s top coffees by Saveur Magazine. Using vintage German roasting equipment, Metropolis Coffee Company’s expert roasters are artists who carefully craft the flavor of each batch. Every bag of coffee is roasted to order and we proudly write the roasting date on each bag before shipping it directly to you. Open one of our bags of coffee and the incredible aromas will put a smile on your face, as will the wonderfully unique, distinctive and satisfying flavor. 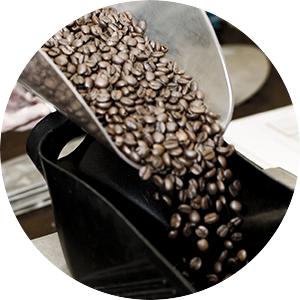 All our coffee blends are organic certified by the Organic Crop Improvement Association. Organic certification proves coffee has been grown, harvested, processed, shipped, roasted and sold in conditions that do not affect the organic integrity of the coffee and help promote sustainability in agriculture. All our coffees also display the Fair Trade logo. Through Fair Trade certification, coffee producers are offered a minimum floor price and a social premium, ensuring costs of production are covered and communities can invest in important social and economic initiatives. 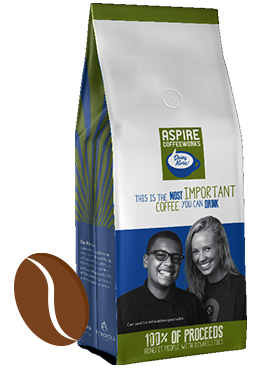 Aspire CoffeeWorks coffee is a brew you can feel good about. From its humble origins to its award-winning finish, it’s coffee that provides adults with disabilities with rewarding work while also supporting Aspire’s programs and services for kids and adults with disabilities.